This is what I call a Scottish Bourbon. Friendly and fruity, with plenty of polished oak. 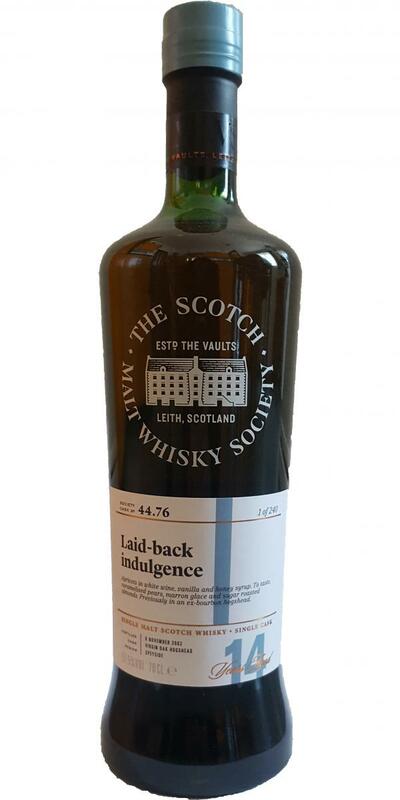 It could be the influence of the virgin hoggie finish, but maybe this whisky was quite mature one year ago too. In any way, this whisky has enough wood influence, but it doesn't push away the distillery character. On the contrary: they complement each other. Profile: malty, fruity and nutty. There is toast, brioche, Danish pastry, sugar, bourbon driven fruit (apricot, tinned peach), hazelnut. Then there is a mineral side too (limestone), and a hint of a salty breeze. What gets increasingly big is the polished oak, with honey, vanilla and supple leather. Full-bodied and sweet. It doesn't get aggressive, it's just nice! The polished oak, leather and peach are most assertive on the palate. What follows is a solid base of malt and yeast, like buns that almost ready. There is only a slight hint of dryness with wood and ginger. Sweet on popcorn, honey, and almond paste, with a bit more room for wood, a little bit of vanilla, and drying spices such as ginger and pepper. Fruity. also some red fruit, leather and plums, I would actually suspect some sherryvat influences. In addition, sweet with vanilla, caramel. Alcohol prominently present but not disturbing. Full smell. Full and soft, red fruit, honey, slightly tingling, leather, spicy. Still some apple. Light peppers now, again red fruit, and leather, honey, vanilla. Long aftertaste. A beautiful straightforward malt that surprises one or the other, the combination of Craigellachie with Virgin Oak seems to work well. There's everything on it: Craigellachie in the form of light sulfur and some sweat, the bourbon barrel with a lot of vanilla and caramel, and the Virgin Oak barrel with more caramel and the famous mixed pickles, but only in homeopathic tins. In addition a few angegammelte yellow fruits and very light alcoholic tips. Longevity married the notes to a strange sweet sulphurous fruit conglomerate. From time to time you might think that you have a middle-aged bourbon in your glass. Does not heat any significant change. Neat start, not nearly as sweet as expected. Lots of fruitiness, apple compote and clear wood notes. A lot of acid on the palate, again neat sulfur. Late comes a mighty load of white pepper, while interestingly it gets sweeter. Dark honey and here too a little impression of a bourbon. Tannins in moderation are also to be found. The finish is unfortunately relatively short, it is dominated first of honey and acid, before it dries again and flows into a very typical for Craigellachie fruity nuttiness, as if you had chewed just a Appelgriepsch. N: Thin sliced [white] bread - toasted golden and glazed with butter. It’s butter sweet in fact, just like Butterkist popcorn. T: Similar desirability on the palate, now with a herbal toastedness, such is that medium char. Overall there’s a sweet-savoury intensity with notes of sweet buttered peas. F: Herbal sweet with a light woody smoke.